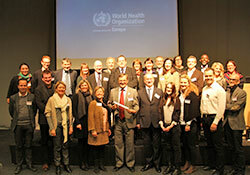 Representatives of the Regions for Health Network signed the Göteborg Manifesto on 6 November 2012. Since 1993, the WHO European Regions for Health Network (RHN) has helped regions to accelerate the delivery of improved population health. Working with WHO, RHN members aim to put Health 2020 into action in their own area. Member regions in RHN have specific roles. Facilitate and advocate for the right to the highest level of health for all. Develop and implement actions that promote health and reduce health inequities. Act as a bridge between national goals and local delivery. Collect and distribute data to and from the regional level. Collaborate with other regions to obtain funds at the European Union level. RHN is a forum to: create synergy between regions and stakeholders in the field of health issues (mutual learning); strengthen cooperation/collaboration between regional and local actors and the international institutions in health; promote the contribution of regions and local authorities, and particularly, health authorities to the international policy-making process; and increase the understanding of regional and local health systems (exchange of experiences). RHN positions itself on the forefront of innovative approaches and aims at becoming a cutting-edge network ready to capture and disseminate effective approaches, policies and strategies that improve population health at the regional level of governance. On 6 November 2012, the members of RHN came together to celebrate 20 years of work with WHO, to launch a new phase of development and to invite new regions to join.